HOLY HELL THIS BOOK WAS AWESOME!!! As per usual, I didn’t read the synopsis before diving into the book. I had heard tons and tons about how amazingly well-written the Crossfire trilogy was (compared to the train wreck that is the 50 Shades trilogy) so when Tor approached me about the review and I saw Sylvia Day’s name, I decided to go for it. Eve of Darkness is the first book in the trilogy. The best way I can think of to describe the genre is imagine Urban Fantasy and the Bible got together and made a severely sexually charged love child. It’s dark but at the same time not and it brings a whole new twist to the traditional Bible stories and the way things “really” went down back in the day. The premise of the story is that people are chosen based on past sins to take on the Mark of Cain – a brand of sorts that basically flips their world on its head. The Mark signifies that their job on Earth is to vanquish naughty little nasties when their time has come and each kill brings the Mark closer to be absolved of their sins. You get the feeling right off that the dealer has stacked the deck in this one. Eve receives the Mark at the very beginning and throughout the book, it’s obvious that her case isn’t quite a run-of-the-mill Mark case. Her superiors don’t follow normal protocol with her and you spend the entire book trying to figure out WHY. Honestly, I wanted to write this big long review to show you all how excited I am about this series but every time I start to type something, I end up clearing it out realizing that it’s going to completely lay waste to all of the twist and turns this book takes and I really don’t want to blow the plot line for you all! So I will leave you with this – If you liked the urban fantasy of Ilona Andrews’s Kate Daniels series, you’d love Eve of Darkness. If you liked the dark fantasy of Karen Marie Moning’s Fever series, you’d love Eve of Darkness. Eve of Darkness gets 5 solid stars from me! I can’t even begin to speak highly enough about this book. Action packed from beginning to end, Eve of Darkness was a wild ride and I can’t wait to see where the series goes! 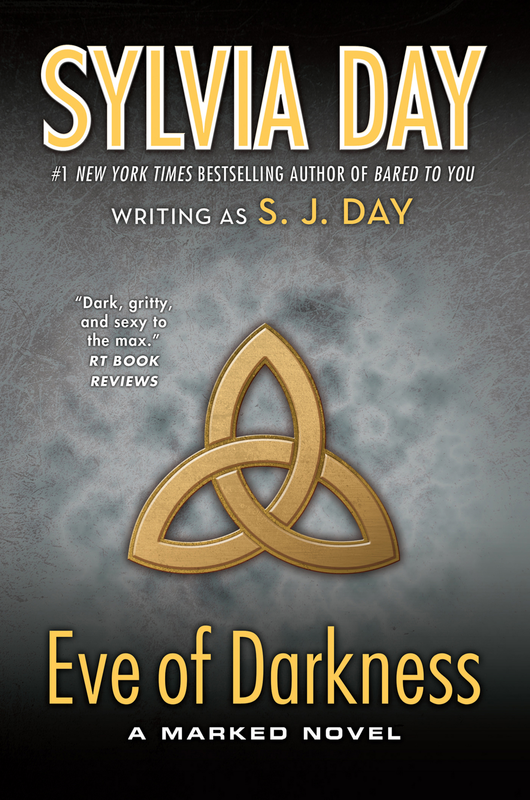 From the 13th to the 15th, we are accepting entries for a trilogy package giveaway of the Marked series by Sylvia Day! THREE winners will all receive ALL THREE BOOKS gifted to them in Kindle format!! One winner will be picked from EACH DAY so be sure to enter all three days!!! I have this series marked on Goodreads. If you’re excited about it, it must be good! It really is! I’m about half way through the second one now. to get started on her Crossfire series. I can see how her books can become addictive. Cant wait to read it…. It will be one of my next series.